Retired Tucson Bishop Manuel D. Moreno, 75, who died at his home Nov. 17 four days after undergoing emergency brain surgery, lived a life of integrity and goodness, according to those who knew the native Southern Californian from seminary days. Cardinal Roger Mahony and Cardinal Justin Rigali of Philadelphia, fellow '50s St. John's classmates of Bishop Moreno, will be among those attending the 11 a.m. funeral Nov. 28 at Tucson's St. Augustine Cathedral. Thousands are expected to visit the cathedral Nov. 27-28 for vigil and funeral services honoring the beloved bishop emeritus who championed evangelization, lay leadership and social justice. 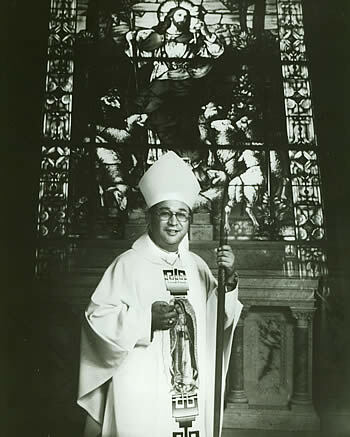 BELOVED BISHOP --- Bishop Manuel D. Moreno of Tucson, who died Nov. 17, is pictured near a statue of Our Lady of Guadalupe in his Tucson residence; in St. Vibiana's Cathedral after his 1977 installation as a Los Angeles auxiliary bishop; and blessing a new priest during an ordination Mass at St. Vibiana's. On Nov. 12, Bishop Moreno was admitted to a Tucson hospital complaining of a severe headache. He was flown to Banner Good Samaritan Hospital in Phoenix, where he had surgery Nov. 13 to relieve pressure caused by brain bleeding. Though the surgery was successful, bleeding began again a few days later and doctors deemed further treatment inadvisable. At the request of Bishop Moreno's family, he was brought back to Tucson Nov. 17 where he died five hours later surrounded by family members. 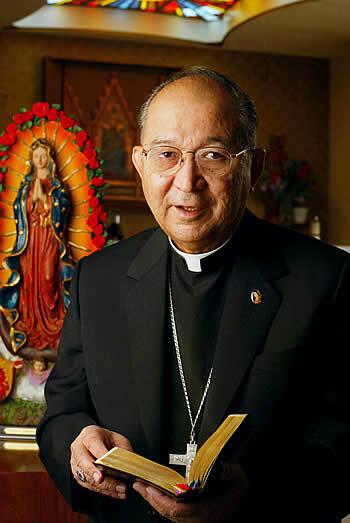 Bishop Moreno had been retired since 2003, due to health problems related to prostate cancer and Parkinson's disease. Bishop Gerald Kicanas, former Chicago auxiliary bishop who succeeded Bishop Moreno in Tucson, will concelebrate at the bishop emeritus' funeral. "All of us in the Archdiocese of Los Angeles thank God for this wonderful, gentle, loving, and unassuming priest of God --- surely one of the best models of the Good Shepherd I have ever known over the years," said Cardinal Mahony, who was ordained one year after Bishop Moreno's class of 1961. At St. John's, noted the cardinal, Bishop Moreno was "very instrumental" in forming groups of seminarians who reached out pastorally to Spanish-speaking migrant families. "We taught the children catechetics and went with seminary priests when they offered Mass in the Bracero camps of that era," said Cardinal Mahony. Bishop Moreno, the oldest of five children born Nov. 27, 1930 in Placentia to Mexican migrant farmworkers, worked with his father, Antonio, in California's fruit and nut groves and packing warehouses while attending school in Fullerton. With the encouragement of his parents who placed a high value on education, he earned a degree in business administration from UCLA in 1953. 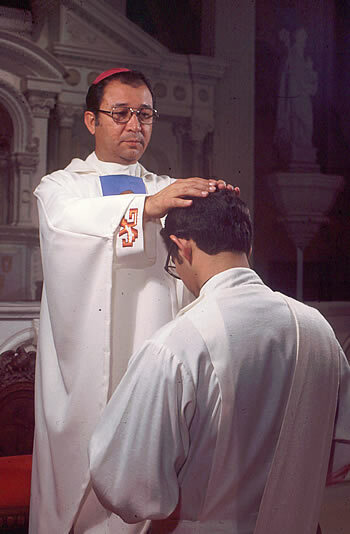 Observing the dearth of Hispanic priests at the time --- only six Mexican-Americans had been ordained in Los Angeles --- Bishop Moreno decided to switch vocational gears and enter the seminary where, as he commented in a 1978 archdiocesan parish talk, "Studies were difficult but God's help was great." He attended Our Lady Queen of Angels Seminary in Mission Hills before matriculating to St. John's in Camarillo. After he was ordained by Cardinal James Francis McIntyre on April 25, 1961, he did graduate studies at the Pontifical North American College in Rome. Upon his return to the U.S., he was assigned as an associate pastor at St. Thomas in Los Angeles where he served for five years before being named an associate pastor at St. Vibiana Cathedral. "His happiest years," said Cardinal Mahony, "were working in downtown Los Angeles as the pastor of St. Vibiana, where his outreach to the poor and to the homeless brought him into close contact to people in need --- following the example of Jesus Christ." While serving at the Cathedral, Bishop Moreno also ministered at the Chancery Office for the Cursillo Movement. "He was a wonderful person of integrity," said retired Father Don Kribs, one of Bishop Moreno's fellow 1961 ordinands. "We always called him 'Manny.' He was affable, very warm and fun. All the Cursillo people loved him," remembered Father Kribs. "He just had that way of gentleness and kindness," added Msgr. William O'Toole, pastor emeritus at All Souls in Alhambra and fellow 1961 classmate. In 1977, he was ordained an auxiliary bishop of Los Angeles, becoming the sixth Hispanic American bishop. In 1982, he was named to head the Tucson Diocese. His installation Mass was the first episcopal installation held in the historic Mission San Xavier del Bac, which was founded in 1700 by Jesuit missionary Father Eusebio Kino. Among Bishop Moreno's initiatives were evangelization and lay leadership development, especially among Hispanics. He also urged the Catholic Church to address the moral and social dimensions of the migration of Mexican citizens through Arizona. Two major initiatives resulted: creation of a Tucson-based Mexico program by Catholic Relief Services, the U.S. bishops' overseas relief and development agency; and the first joint pastoral letter issued by the U.S. and Mexican bishops' conferences, "Strangers No Longer: Together on the Journey of Hope," approved in 2002. Bishop Moreno was also a strong supporter of interfaith and ecumenical outreach among southern Arizona religious leaders. He established the diocese's Catholic Social Mission Office, focused specifically on social justice and promotion of the church's social teachings; greatly expanded the role of laity in executive diocesan positions, including naming lay people as chief financial officer and chancellor; and established the diocesan Respect Life program. Among major challenges of Bishop Moreno's episcopacy were the financial failure of the diocesan television station, which ran up a $30 million debt, and the emotional and financial blows of the clergy sexual abuse scandal. Lawsuits alleging that the diocese failed to protect children by allowing sexually abusive priests to remain in ministry were settled in January 2002 without a trial. The diocese later went into bankruptcy protection because of settlement costs, emerging from bankruptcy in September 2005, after paying out an estimated $40 million in settlements of clergy sexual abuse cases. Over the last four years, Bishop Moreno apologized publicly several times to abuse victims and their families, asking forgiveness for his failings and mistakes. He also met privately with several victims of abuse, according to diocesan releases. The diocese now has a sexual misconduct review board, a diocesan Office of Child, Adolescent and Adult Protection, and a code of conduct for all who minister in the diocese. "He loved all of the people of Tucson greatly, and suffered much and silently when problems in the diocese would arise," said Cardinal Mahony. "He brought all of his anxieties to prayer, and we would chat frequently about his hurdles and obstacles. I was deeply impressed with his simple faith, firm trust in God's providence, and his hope that God's grace would help restore healing to all of God's people."